Well – I *might*have blown Stitch From Stash. If I spend nothing more & have no finishes, I will end up at $16.03 at December, which is a very small amount indeed (if we are calculating the whole year, which thankfully we’re not, I’d be at -$88.49 & not in credit until April 2018!!). But it is OK, as I am happy, & unlikely to spend heaps between now and January except on the odd skein or two. Gail so very kindly loaned me Fairy Idyll!!! I have been wanting to stitch this 1996 chart for ages, & couldn’t find it for love or money. So I brought a piece of Applemint Lugana from Catherine at Countrystitch especially for it. This needs to be my focus piece until I complete her. Luckily there is plenty to hold my interest & keep me going! And this month I finished two of the Florence version of the Mill Hill Renaissance Santa’s, & then found that the Fox Collection sold them MUCH cheaper than the LNS. I’m talking ten bucks cheaper per item, people. Now, I work retail so I understand margin & if it had been only a couple of dollars, I wouldn’t have brought from the online. But overall twenty dollars is substantial. And I also spent $91 at the LNS, on fabric, Thread Heaven (before it disappears entirely), speciality threads (Waterlillies are ten dollars each here), beads etc. Thank goodness for the finishes I had! This month, in addition to finishing Mia Mermaid, Hawaii Santa, Florence Santa x2, I also started the Jamaica Santa for International Talk Like a Pirate Day, worked on Nantucket Rose’s tree canopy, finished Blitzen (except the ribbons) is done on my Reindeer Parade & I started Prancer. And of course I managed to work out the start point and did four threads of Fairy Idyll last night (Simon has discovered Taskmaster, & it’s hard to do a new start when you are watching something interesting and laughing you’re a$$ off). So far this month I’ve only had one day where I didn’t stitch at all. Note: SFS is a closed facebook group hosted by Stephanie (Ms Oh Sew Crafty). Registrations for the first part of 2018 will be opening up later this year. WIPocalypse is hosted by Measi over on her blog and in facebook. Click on the link to the right to be taken to the blog. whoa – some lovely comments from post #200 & my give-away! This is still running; please click and comment on that post. 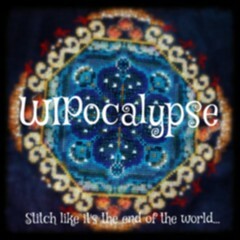 WIPocalypse is hosted by the lovely Measi over on her blog. Please click on the icon to the right; it will take you to her blog. You can check out years worth of submissions! It’s fun (for me) to see the progress fellow stitchers make, & get haul ideas. Question of the Month – How do you get yourself out of a stitching drought? Yeah. I’m there. I have ALL THE THINGS but ouch! wrist movement since that big BBM morning. I wear a brace to drive & stitching is so minimal. I have too many options too, which is making me pause. On Nantucket Rose, I am maybe 8-10 thread lengths past where I was last week. It’s so minimal I can’t even be bothered to take a photo. All I have finished (& by finished, I mean up to the “cut out the backing & glue magnets on) are two pairs of Lucie Heaton Designs Chucks from the September Cross Stitcher magazine. Red for Louise, purple for Aliese. At least they will qualify for a Smalls SAL entry! So stitch-from-stash, I’m still in the black & intend to be there, all going well & if Nora doesn’t release anything amazing between now and when I can legitimately ask for Christmas presents! YTD I am now -$48.40 but will be in the black by October, without any additional spend or finishes. I must look at the group & see if Stephanie (Ms Oh Sew Crafty, check out her blog for some serious stitchy progress!) has the check-in post up. So August is a bit of a wash really. I spent, but only one piece. Even if I had full movement of my wrist, no way would I get to complete the top leafy portion, but at least I was close to monogamous for the month. September Plans are to be in-line with Stitch MAYnia SALs, the Mira month & Return to Hogwarts. I plan to pull out either Mia Mermaid, or my Reindeer Parade; and the Clouds Factory Hogwarts banners to start (I have abandoned the initial 36ct start!). There’s also the 19th Pirate day, & I’ll pull out the Mill Hill Jamaica (mon) Santa for that one. So, if you’re a regular reader, thanks for getting this far! And if you’re a WIPocalypse check-in-er, I look forward to seeing your progress too. Have a lovely month! Okay then! Let’s get into this. So the number is very, very arbitrary & we won’t get into my dodgy calculations to work out how many WIP Wednesday posts I’ve done since moving to WordPress. There are a few, so let’s leave it at that & get to the exciting stuff. After 10 days or so not stitching, I am back working on Nantucket Rose, altho only 2-3 thread lengths per session. Anything more still hurts! I am about a quarter towards my goal of completing the top canopy. I don’t know if I will continue on her past the end of August or swap to my planned Mira month or Return to Hogwarts which are the Stitch Maynia SALs. If I have the fabric I might just start the Clouds Factory Hogwarts House banner pattern. I’ve chosen my favourite designers or themes here. Hopefully there is something to entice everyone! Right. Have fun, share this around, do whatever. TTYL! WIPocalypse is hosted by Mel at her blog http://measi.net/measiblog/ 2016 was the sixth year of the SAL, and my second year participating; let’s go for a trilogy. January first is all about setting goals for the year, so that in early December I can go “oh crap!” LOL This year I intend to be multi-platform again, with the daily focus being on Instagram but at least the WIP Wednesday, Smalls and WIPocalypse posts here on the blog, and a monthly Flosstube. I have weekly rotation plans written in my diary to take me thru to the end of March & I will review then. 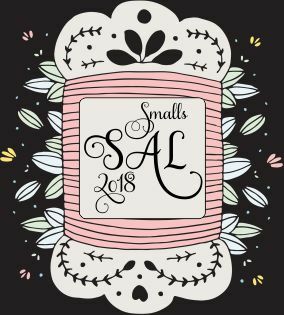 StitchMaynia’s monthly SAL e.g. Feb is “fandom” (I am thinking Cloudsfactory Labyrinth), March is Teresa Wentzler (Tapestry Cat). December/January has the 12 Days of Christmas, starting on Christmas day and finishing on the 6th – I will be taking my Hands On Design Christmas Chalk away with me. Mostly because I paid for the fabric (32ct!!) and I need to use it, so if it’s all I have with me I should see some progress. StitchMaynia’s colour SAL (this is only on the 15th of each month). The Never Ending Band Sampler (as my learning piece of the month). The Magazine SAL (as hosted by Heather; click the image to the right for more info). This piece will double as my Smalls (click on that image for more info) post as I intend to use the JCS Christmas magazines all year, especially now that I have the CD with the past issues! The Round Robin piece, whatever it is and whenever it arrives. Focus on a Finish – whatever needs completing from the above or a current WIP that is nearly there. Mermaids of the Deep will be high on that list. Ten’s not so bad, really!